The series is a historical crime drama depicting the actions of a new police commissioner in Berlin during the political and social upheaval of the golden twenties. Where can you stream Babylon Berlin? On 2017-10-13 Drama TV Series Babylon Berlin first aired on Das Erste. 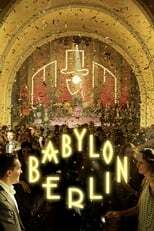 Written and created by Tom Tykwer & Achim von Borries, and produced by Beta Film & ARD/Degeto Film, Babylon Berlin will return and was last broadcasted on 2017-12-01.